The world seems to run in one direction and hence, they can’t accept people who tend to make their own ways and reach their desired goals. We all have certain dreams, aspirations and aims which are more related to what we want to do but the reactions from the society makes it impossible for us to go ahead with them. People often call such people as the ‘Bad Elements’ of the society but according to me, this is exactly what we should be. Let’s cut the crap and come to the point, today I’ll be taking about a trend-setter, a badass, a man of his dreams, a tattoo artist, an artist and an achiever. 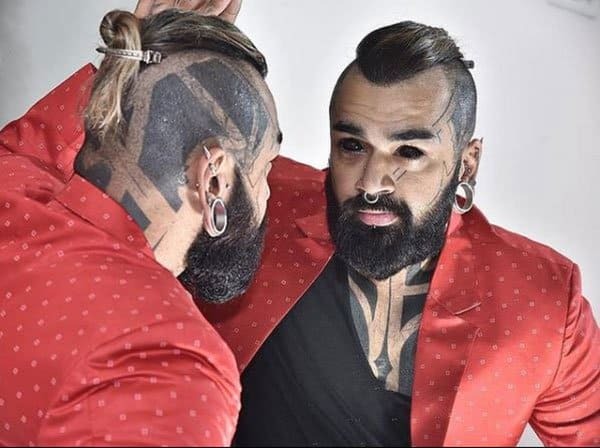 I am talking about Tattoographer Karan- King who is the first in 1.3 billion Indian to get his Eyeballs Tattooed. Yes, you heard that right. He got the white part of his eyes colored with black color. 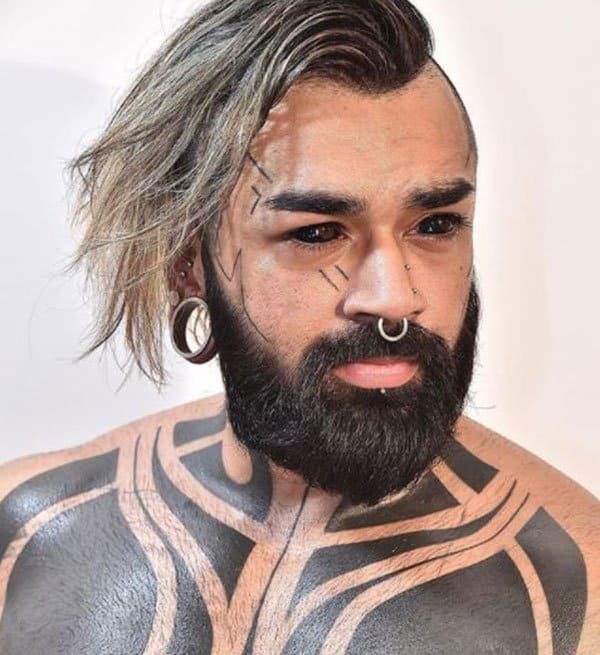 Leaving aside the eyeball ink, King also has 22 piercings on his body and is on the way of getting a full body-suit tattoo which will cover him entirely. He says that the first tattoo he ever got was when he was just 13 years old and started making tattoos when he was 16 years old but back then, it was just a hobby for him. Today it’s his passion! 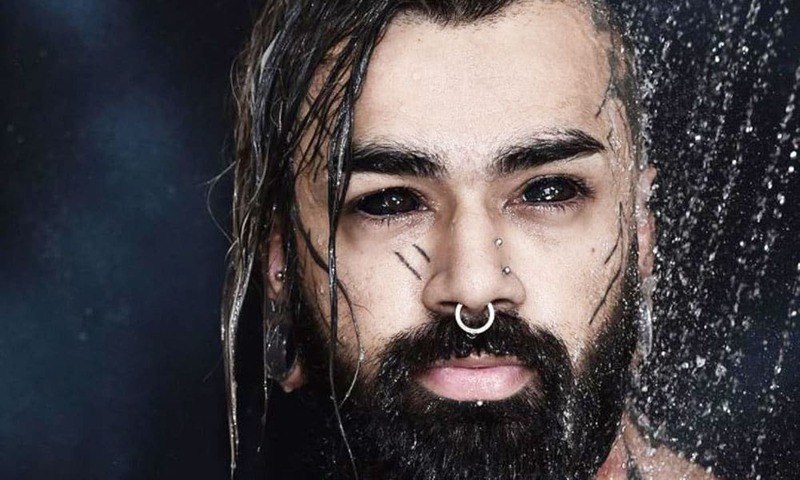 Though a lot of doctors have argued upon the adverse effects of getting the eyeball tattooed, Karan on the other hand says that he agrees that the risk is involved and hence, people should get it done from trained professionals and tattoo artist. He got his tattoo from Howard Smith from New York, who is the person who invented eyeball tattoos and has inked around 100 people in the eye. Karan says that he has no regrets for getting his eyes colored as it was something he always planned to do and did a lot of homework before getting it done. He also confessed that he debated for a long time with his family and friends before getting it done. According to him the inking procedure feels like hot needles getting pricked in the eyes at a fast pace, it takes around 40 pricks in the eyes to get it covered in the color entirely. This 28 years old wild-heart is becoming an inspiration for a lot of people not only in the aspect of tattoos and piercings but in the aspect of following ones dreams. A lot of people have been criticizing his deed but he has only one reply for his haters and that is “I was about to be dislike for my accomplishment anyways and still I did it because I wanted it; my eyes; my happiness; my life”. Isn’t this the best reply ever? Karan has broken stereotypes in a country like India which is in it-self a very big achievement. We are proud of Tattoographer Karan – King for standing and living-up for his dreams. He is an inspiration no matter what, people will always have a problem with everything you do but at the end of the day what should matter to you is YOUR OWN HAPPINESS. The Bible has no record of what Jesus did after the age of 12 until 30, what happened during this time?